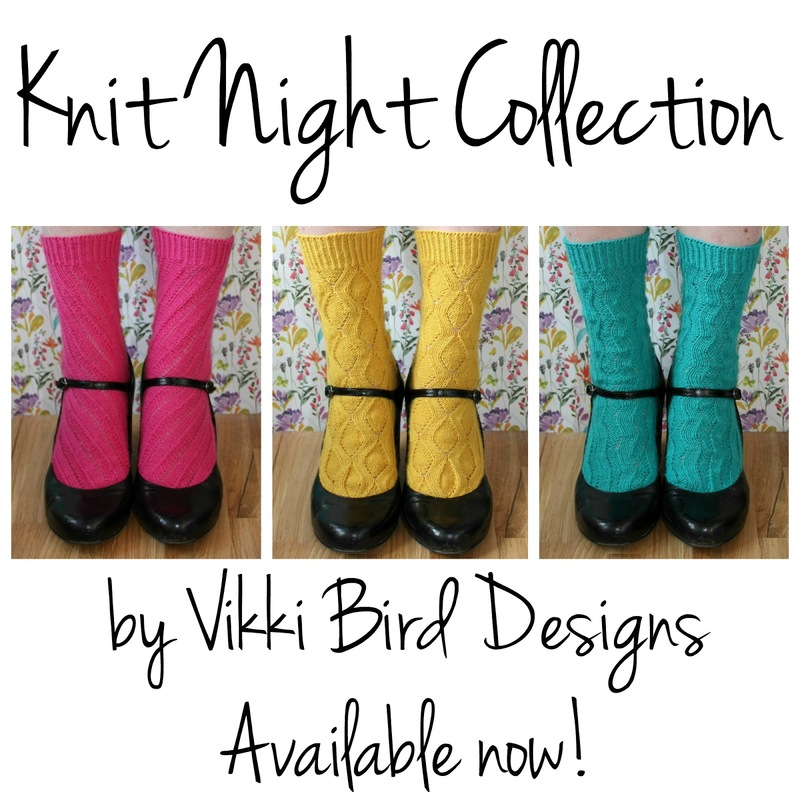 Today I am very, very excited to launch my first ever collection of sock patterns: the Knit Night Collection. The Knit Night Collection features three different sock designs, and each of the patterns has been named after a special knitty friend. 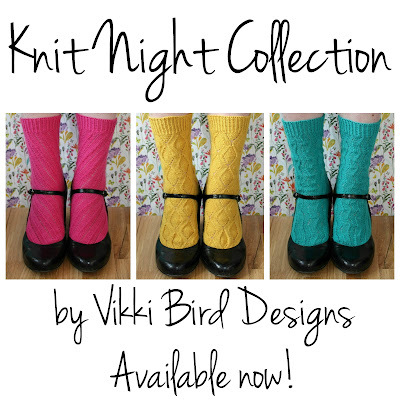 Each of the socks is knitted from the toe up using a gusset and heel flap construction, shaped with short rows. The socks have a pattern on the instep and around the leg, while the sole is knitted in stocking stitch. The gusset length is affected by your row/round gauge, so a small amount of optional maths is included to achieve the perfect fit (the maths is completely optional; I know some people really don't like maths!). All the socks in the collection come in three sizes (finished sock circumferences, 17.5 (20, 22.5) cm [7 (8, 9) in]), with the different sizes being created by scaling the pattern, so larger socks have larger motifs. The patterns in the collection are written to be needle-neutral and can be knitted on any of DPNs, short circulars or long circulars using the magic loop technique. All the socks shown are knitted in West Yorkshire Spinners Siganture 4ply**, which is my favourite sock yarn. The yarn is 75% wool and 25% nylon, but any sock yarn can be used. I would recommend using a solid or semi-solid to really let the pattern shine. I am hosting a knitalong for the collection in my Ravelry group. * The KAL will run from now until the end of May, I would love it if you could join in (and there are prizes to be won!). Head over to my Ravelry group* for more information. One of the pairs of socks in this collection may look familiar: the Lynda socks were first included in Knit Now Issue 66. *You will need to be logged into Ravelry for this link to work. **This is an affiliate link. See my Disclaimers and policies page for more information. You had to really! Thanks for letting me steal your name!